Yes, we can! Just let us know what you need in the Special Instructions box at checkout. We do our best to get orders wound and out the same day or next day but if we have many requests for winding, your order may experience a delay. Please note that wound yarn can not be returned for store credit. What are the origins and ethical standards of Purl Soho brand yarns? The origins and ethical standards of our yarns are as important to us as their beauty. We only work with yarn producers who share these values by maintaining strict standards for the treatment of animals and workers and by following the European guidelines for environmental safety. Further, within the Purl Soho yarn collection, all of our wool is mulesing free, and our mohair complies with the highest level of industry guidelines in South Africa. How do I add a Purl Soho pattern to my Ravelry library? Please note that you can only add Purl Soho brand patterns directly to your Ravelry library. (Other brand patterns require that you download to your desktop, then upload to Ravelry manually.) To add a Purl Soho pattern directly to your Ravelry library… First, make sure you’re signed into your Purl Soho account, then click your name in the top left corner of any page to go to My Dashboard. There, click My Downloadable Products in the left margin. 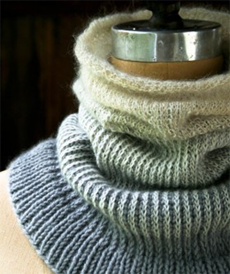 You will see a list of all the downloadable patterns you have bought from Purl Soho. In the Ravelry column to the right, click on “Add To Ravelry.” When you do, it will change to “View On Ravelry.” Click that and you’ll be taken to Ravelry’s homepage, where you can navigate right to your library! How do I download my Purl Soho pattern? First, make sure you’re signed into your Purl Soho account, then click your name in the top left corner of any page to go to My Dashboard. There, click My Downloadable Products in the left margin. You will see a list of all the downloadable patterns you have bought from Purl Soho. Then click on the Download button next to the pattern that you would like and and your download will begin! Please read all about our return policy here. Are colors accurate in your photos? We do our very best to make the color in our photos as close to real life as possible. Even so, we can't guarantee that what you see on your monitor is accurate, since each monitor shows color differently. If you have any questions about color, please feel free to call customer service at (800) 597 PURL for clarification. How do I know the size of a fabric's print or pattern? All scanned images of fabric (as opposed to images of fabric on the bolt) represent a 9 1/2 x 11 1/2-inch rectangle, with the selvedge oriented vertically. Are gift cards processed automatically? Emailed gift cards are processed automatically and will arrive immediately in the recipient's inbox. Physical gift cards, like all other products, are processed for shipping Monday through Friday. Can I visit the warehouse in California? Yes, we love meeting our online customers! You can shop at the Tustin, California warehouse Tuesday-Friday, 9am-2:30pm. Please note, we are closed on the Tuesdays that follow Monday holidays. We are also closed to the public during online sales. If you are visiting with a large group of people, we would love to know ahead of time. Also, keep in mind that, if you visit in the winter, our warehouse can be on the cold side (yes, even in Southern California! ), so bring a (hand knit) sweater! Can I pick up my order at the New York City store? Unfortunately, no. We maintain two separate inventories, one for our New York shop and one for our California warehouse. While, for the most part, we do carry the same things at both locations, we cannot ensure that the exact items online are also currently in stock in New York. Why is your warehouse fulfillment center located in California? When Purl Soho opened as a small knitting store back in 2002, there was only one owner, Joelle Hoverson, and she lived in New York City. A year later Joelle's sister, Jennifer, joined the business to head up the website warehouse. While she loves New York, she really loves California, so the decision was made to run the warehouse from Orange County. Purl Soho's newest partner, Page Marchese Norman, lives near Joelle, and together they try to convince Jen to join them on the East Coast... but she just can't give up the sun! It depends on where you're shipping! We have business locations in New York, California, and Connecticut, so you will be charged sales tax if your package is shipping to those states. Why is your domestic shipping rate so high for small items? Our shipping rate for US orders is based on a one-pound package with insurance up to $100.00. UPS requires that we round up to the nearest pound, so even small orders such as a quarter yard of fabric or a pair of knitting needles is still considered a one-pound package. We do have a special shipping rate of $6.95 for domestic standard shipments that include only patterns and/or gift cards. If we are able to offer you this rate, we will! Will my international shipment be charged customs fees/VAT upon arrival? Unfortunately, we have no control over customs fees/VAT tax to international destinations. Each country has different rules on what is assessed, so if you are concerned, please be sure to check the limits in your country. We do not have free samples, but for fabric, you can order as little as a quarter yard. For yarn, we regret that we cannot offer samples for free or otherwise, since it would take away yardage from the skein. No, we do not have a printed catalog, but our website is an accurate and beautiful online catalog of what we currently carry and have in stock. If my order contains a backorder, when will the other items in my order ship? The other items in your order will ship when your backorder item arrives, so you will receive your entire order at once. If you would like us to split the order, please let us know in the Special Instructions box at checkout. We charge your credit card at the time you place your order. If you have any other questions about products or anything else, please email us at customerservice@purlsoho.com or call us at (800) 597 PURL!